With just nine days until May Commencement, you can feel the graduation jitters. Spartans are putting last-minute touches on their cap designs, cramming for final exams and flocking to College Avenue to take photos in their graduation garb. UNC Greensboro senior Baraka Ongeri is one of more than 2,700 Spartans set to graduate next Friday, and one of three seniors who will be highlighted on the UNCG website in the coming week. He’s an acting student, a future New Yorker, a board game player and an amateur musician. You may recognize him from UNCG’s production of “Antigone” in the fall, or from Triad Stage’s rendition of “A Raisin in the Sun” just a couple months ago. 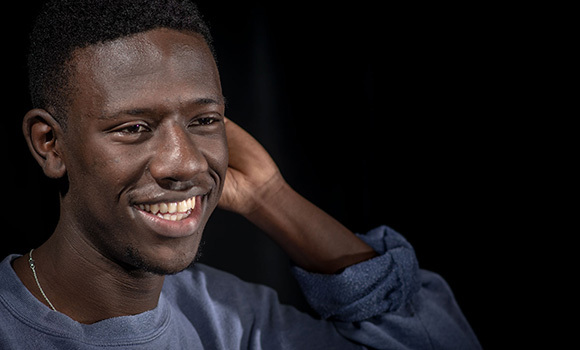 Ongeri recently shared about his experience in the UNCG School of Theatre and his plans for the future. Below are some highlights from the conversation.